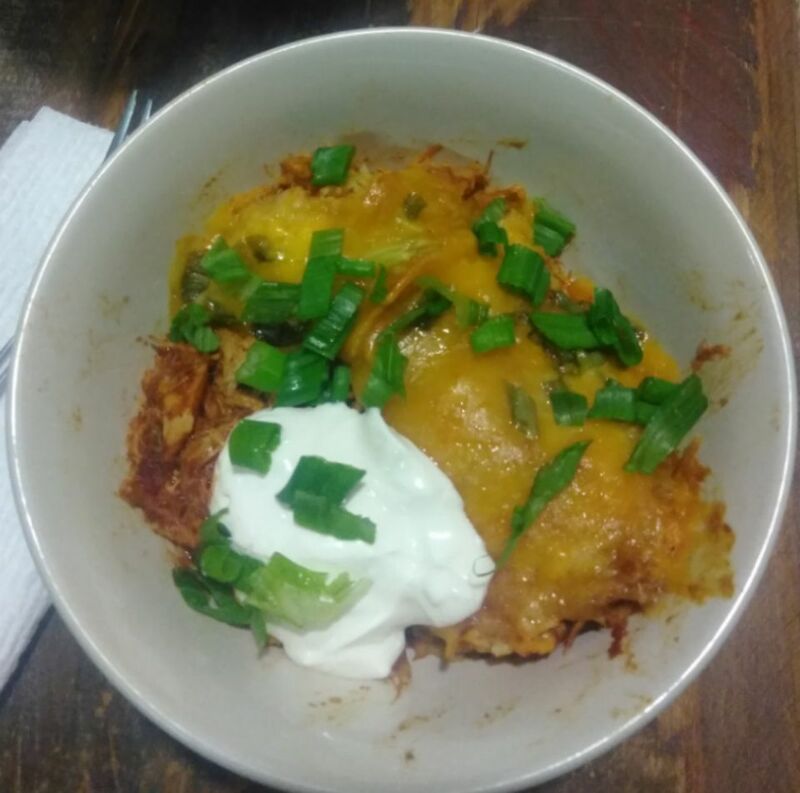 If anyone wants to invite me to a Dia de los Muertos party or potluck, I’ll bring the perfect dish — slow cooker enchilada casserole. With the Mexican holiday coming up later this week, I wanted to make something that would help me get in the spirit. I admit this dish is not the most traditional of Day of the Dead food, such as pan de muertos, tamales or sugar skulls, but I promise it’s tasty and would be a hit at any party. And I know my ancestors loved enchiladas. It’s one of the meals I ate most growing up. Also, in the spirit of slow cooking and my monthly recipes, I didn’t want to make anything difficult. Day of the Dead is about celebration, and I don’t want to be slaving away all day for a meal. This may be the easiest enchilada dish you will ever make. Cook 2 pounds of chicken tenders in 28 ounces of enchilada sauce (I used Old El Paso hot flavor. I like it spicy.) for 3 1/2 hours on high. Shred the chicken. Mix in one cup of Mexican cheese and 12 corn tortillas cut into fours. Add one cup of chopped white onion and two more cups of cheese. Cook on low for 25 more minutes, and you’re done. It’s really that easy and can be done in less than four hours. Garnish with olives, green onion, sour cream or whatever you like. If you’re not attending a Dia de los Muertos party this weekend, this is still perfect for dinner. You’ll like it so much, you’ll be glad to have leftovers for lunch the next day. Email prasmussen@themonitor.com with recipe ideas. >> Cook chicken in enchilada sauce on high for 3 1/2 hours. I use chicken tenders, which tend to cook faster. But every slow cooker is different. >> Mix in one cup of cheese, 1 cup of onion, and the tortillas cut into fours. >> Pour two cups of cheese and 1/2 a cup of green onion on top. Cook on low for 20 to 25 minutes.